"These make real mouth-watering 'Pig-cicles'! They take a while to cook, and when you eat them, you'll have pork fat smeared from ear to ear! Mmm! Mmm! I like to smoke with hickory wood, but any of your favorite will suffice." These ribs were the hit of my 4th of July party. I couldn't believe how quickly the disappeared. Even the kids ate them, what a great mess they made! They were delish!! 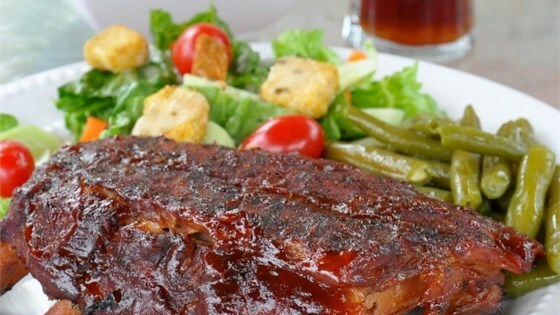 I've been looking for the 'right' rib recipe for a long time and this one is WONDERFUL! A little too sweet and cinnamony for my taste but I would make again with less of those ingredients. This recipe was excellent. We had out neighbors over and they loved it as well.